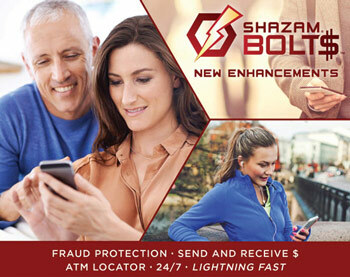 With the Shazam BOLT$ app, you can access balance information for your debit card on your smartphone, tablet and home computer. You are able to pause your card with the transaction control feature and use GPS to locate nearby ATMs. The transaction control feature gives you more control over your accounts. You will be able to pause your card, without affecting previous transactions, if your card is stolen or goes missing. With the quick tap of a button, this feature allows you to block or unblock your own cards. Easily locate surcharge-free ATMs using GPS technology. No matter where you are, you’re able to locate the nearest ATM along with directions.